Cook rice in water as directed on package. Meanwhile, in small bowl, mix broth, cornstarch, soy sauce and brown sugar. Stir until cornstarch is dissolved. In 12-inch nonstick skillet, heat oil over medium-high heat. Add gingerroot, beef and onion; sprinkle with salt and pepper. Cook 2 to 4 minutes, stirring occasionally, until beef is brown. Remove beef mixture from skillet; cover to keep warm. Add broth mixture and broccoli to skillet. Heat to boiling; reduce heat. Cook 5 to 10 minutes or until sauce thickens and broccoli is tender. Return beef mixture to skillet; cook until hot, stirring occasionally. 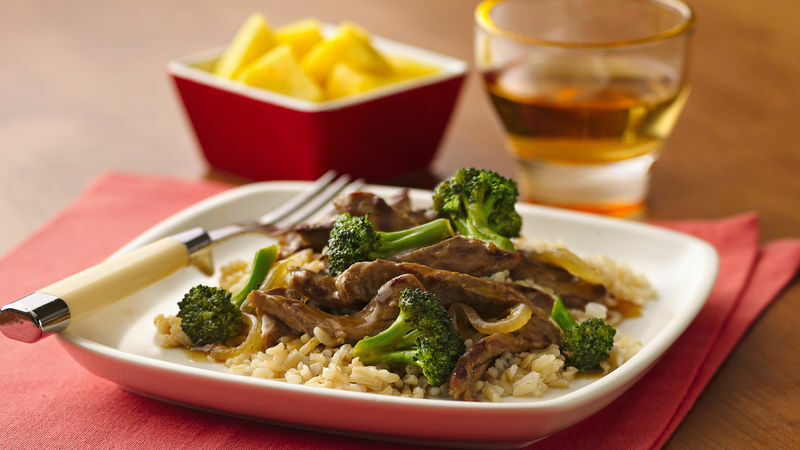 Serve beef with broccoli over warm rice. Stew meat that has already been cut up can be substituted for the steak. Try different flavors of rice, such as rice pilaf.